You have to think creatively, when you’re curious and right now I am interested in all aspects of fall. For me it has to be the most elegant of seasons with leaves changing colors, falling to the ground and blowing in whirls like mini tornadoes. The smell of smoke wafting throughout the air from fireplaces and nothing says autumn like steaks cooking over an open fire. Homes are being tastefully decorated and recipes passed down from prior generations are being updated for the coming holidays. There are many precious gifts in life, but the gift of time has to be the most coveted. When daylight savings time occurs there is nothing like settling in with hot apple cider, naps and still have enough time in the day to enjoy the evening before bedtime. Pumpkins grown in the gardens at Heath have been shared with neighbors and friends for holiday decorations. And, of course to be used in recipes for pies and a variety of breads. The last batch of crabs caught by my brother Paul and his friends on their boating trip to Long Neck, Delaware earlier this month. The steamed crabs were served with corn and hush puppies as an easy evening meal and tasted absolutely delicious!! Lay cubed pears in layers in an enamel pan, sprinkling each layer with sugar and whole cloves. Cover pan; let stand overnight. Drain off syrup and heat to boiling. Add pears carefully with a spoon. Boil rapidly about 30 minutes on medium high heat. Reduce heat, simmer slowly until pears are transparent and have a rich color from the syrup. Pack into hot sterilized jars, seal. About 8 pints. Sounds like you have a plan for these verdant autumn days when nature does it’s thing, and puts us all in the mood for tasty seasonal treats. I’ll indulge with you over the Christmas holidays. Enjoy! I brought the house plants in from the deck as we are under “freeze warnings” over the next few days!!! it is getting very chilly! 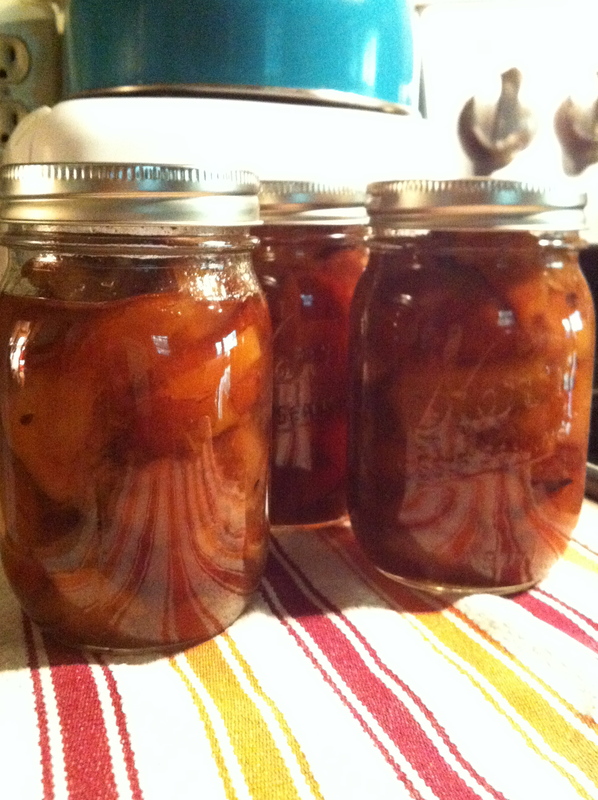 The homemade pear preserves look so delicious in the mason jars. How about some on a biscuit, please. Love the way you present your food items on your blog. Tastefully arranged.